This may be a little off topic for trawler guys, but may be of interest to many of us former sailboaters. Aboard a cruise ship, halfway between Baltimore and Bermuda, we altered course to assist a sailboat. Exact details still not disclosed, but we wound up dispatching a small tender, transferred several fuel bladders and jerrycans, and he went in his way. It looks to be a Hunter center cockpit, about 42', being singlehanded when the guy apparently hit a squall which blew out the headsail. The in-mast furling main wasn't deployed so I'm guessing it was jammed. The cruise ship's crew first tried to bring the boat alongside, then put the tender in the water. When the fuel was eventuallly put aboard, they seemed to be avoiding and contact, and no one went abound the sailboat even though it was clear that these fuel bladders, maybe 15-20 gallons each, were a real handful for the skipper. Question for the forum: was all this " hands off" action related to maritime salvage issues, safety concerns, or what? Other than the torn sail there was no evidence of damage to the boat, engine was functioning, etc. Just a guess but I would bet it is related to any issues of liability. As soon as a cruise member steps abound the sailboat, they increase their exposure. It is also possible that the sailor didn't want anyone stepping on board. Interesting about the mainsail. My boat has in-mast furling which I love for a coastal cruiser. It would not be my first choice for off-shore however. A buddy of mine has in-mast furling on his Beneteou and has been very happy with off-shore sailing. Something similar happened to a group of nordies that crossed the atlantic earlier this summer. Google NAR 2017 and you will probably find it. Two boats diverted from the group to provide some fuel. They went as a pair for safety in case they were being lured into some nefarious situation. But as is almost always the case, it was about incompetence, not about subterfuge, and they transferred some fuel and returned on their way. He was only carrying one headsail? I don't believe the issue was salvage or liability to the cruise ship crew. My guess is a safety issue to either the sailboat crew or tender crew. The captain of the cruise ship may have had orders to the tender not to board s/v for security reasons. There is no such thing as forcing salvage on someone. It must be accepted by the casualty. It may have been the Capt. Of the sailboat did not wish to take on the liability for the safety of the crew of the cruise ship trying to board his vessel. That is why they let the Capt. Load the fuel. That is just a guess, but it has happen. A friend and I were off the east coast heading T&C when we hear a call for help from a disable sailboat. A Cargo ship as well as us found the fella and it was clear the sailboat needed a tow. The Cargo ship couldn't do it so that left us. My friend chatted with the sailboat Capt. And asked if he would take liability to any damage done to his vessel if he tow him in. The Capt. Said NO! To make a long story short. After some convo with the USCG and the Capt. Of the Cargo ship, we just hang around until the USCG show up then we and the Cargo ship left. My take on it, (which could be wrong) Is the Capt. Of the cruise ship has the liability of his crew and so does the cruise line they work for. If the sailboat Capt. Said he would not take the liability of the boarding crew, I could see the Capt. Of the cruise ship telling his crew not to take any risks. Let Capt. of the sailboat take all the risk of loading the fuel. My cruise ship is experience is from 25 years ago, but we used to go on other vessels all the time. We'd take boats to the islands before the passenger tenders brought the passengers over, we'd go out on dive and snorkel boats, we'd take medial emergencies ashore..... I would guess that it was the sailboats wishes and not the cruise ships. With various crew I've had aboard in the last 4 years, my mantra has been to not extend body parts past the confines of the boat. Because that's pretty much the only way to die. If I hit the dock (or fill in the blank) to hard. That's on me, but can be repaired. "You're leg, Arm, in between the 20,000 kg boat and the immovable dock, will make no difference, because we are either: going too fast to dissipate that much energy or we're not, in which case your arm will made no difference." My point, is that if I were captain of the cruise ship, I'd tell my crew not to get off the tender unless absolutely necessary and fuel for a sail boat ain't. 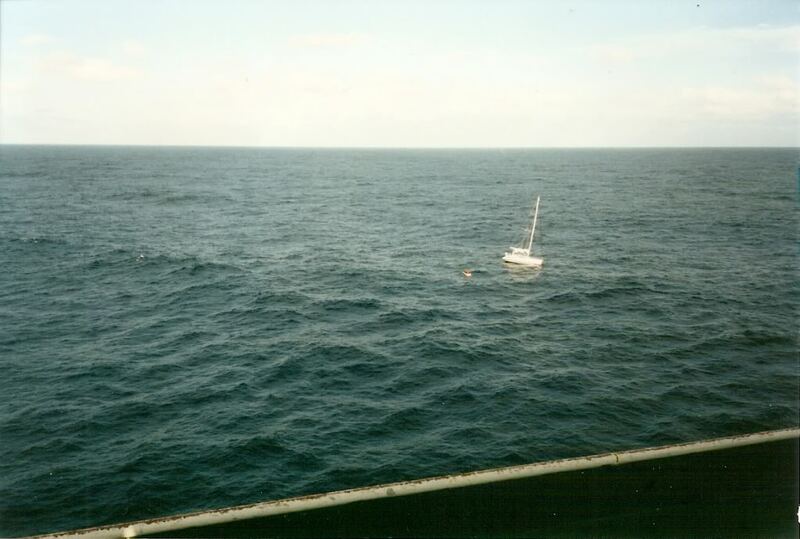 Fourteen years ago, three days out from San Diego on the way to Hawaii, our ship answered a distress call from a sailboat's crew, taking us a day out of the way. At the rendezvous, the sailors abandoned the boat for their motorized dinghy to board the ship. The abandoned boat was left to drift away. A 4 hour delay in cruise ship itinerary is huge. There is no salvage here for a cruise ship, it is in the best tradition of the sea to render assistance to this "casualty". The cruise ship lost time (equals money) by doing this. Not in this instance but salvage awards that seem outrageous to the layman are self serving to the insurers in the long run. The commitee of LLoyds, (at LLoyds of London) is made up of individual companies insuring all or part of risk on vessels or anything else for that matter. There are certain financial responsibilities to be a member (big deep pockets). This insurance market goes back years and years and is based in old English law. The salvage agreements to protect both property owner and insurer are basically simple. The insurer says the salvage was a piece of cake and the salvor says it was horrible and we risked life and limb. A "claim" is submitted by the Salvors for compesation based on risk, salved value and a few other details. Insurer posts bond equal to salvors claim. Bond is not the salvage award, but a get out of jail until its settled card for the salved vessel. Both sides negotiate the claim and if it can't be settled, it goes to arbitration. The LLoyds arbitrators have to have several qualifications but the 2 biggest are Queens counsel solicitors (big time attys) and also be master mariners. Nobody is going to bs these fellas. Unlike the US judicial system, LLoyds salvage disputes are handled quickly, and inexpensively. Its a no nonsesne system that has been inplace for hundreds of years to protect shipping worldwide. Past opinions of salvage awards have been to promote salvors to take risk to their crew and vessels, In other words lets appeal to the greed of salvors so they won't turn away from a vessel in distress. Why would you risk your boat, crew, equipment to save property at sea if you weren't compensated? The premise of marine salvage in this instance is "NO CURE, NO PAY". I know of a prominent East coast salvage company that spent 12 million dollars on a job under No Cure No Pay terms and lost.Its part of the business. Marine insurers want salvors out there with equipment and expertise, risking crew and huge operating expenses that this work requires. Most of this isn't related to yachts that we enjoy but it relates. In my experience, cruise passengers love rescues...while delays are often not desired, I am not so sure the time isnt well traded. The publicity isnt bad either. I think cruise lines could care less about minor assistance. But if worth pursuing, I bet there is a legal team on call to deal with salvage clains on a regular basis. Some of the cruise ships that leave Boston won't even slow down enough to disembark Harbor pilot. Its cheaper to pay them to ride to NY on pay and fly them back. Thats a tight schedule in my book. The priority is getting offshore far enough to open the casino. Many cruises have dedicated sea days where they just drift for 24 hours. I enjoy at-sea days. Very relaxing, and it's not like we're just drifting. And we don't gamble, although we've met some people who live to gamble. Our score for that happening is 0 out of 5 cruises. BS I think. On a RCCL ship, an experienced cruiser told me I could draw on my shipboard a/c for cash at the casino, thus accessing an unused credit that came with the booking. No bets were placed.I have a feeling that loophole got closed. The cruise lines make lots of money in the casino and gift shop..which can only be open when they are a certain number of miles off shore. The quicker they get there the more money they make. "Other than the torn sail there was no evidence of damage to the boat, engine was functioning, etc." This just goes to show the idiocy of roller furling for an offshore vessel. The classic methods of sail handling may be cumbersome for an afternoon sail , but are well proven for voyaging off the shelf.